This chapter explains how to read and write metadata. 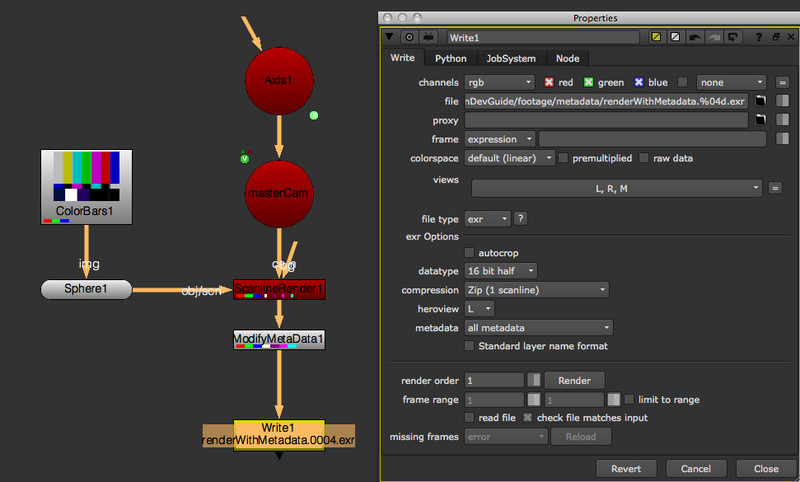 To create custom metadata in a stream, you need the ModifyMetaData node. To render custom metadata, you need to use a file format that supports it (for example, exr). The ModifyMetaData node accepts expression syntax, which means you can use TCL and, to a limited extend, Python. In this example, we want to write a camera’s focal length and aperture as well as its transform matrix into the metadata. By placing the above code into your init.py or menu.py (or by importing it there), you can make it available in the knobs and therefore add all kinds of customizations to your ModifyMetaData node. In this example, we look at a script that creates a camera based on the metadata in an exr file. You can download the example exr sequence here. nuke.getFramesAndViews returns a list where the first item is the frame range and the second the requested views. Split off the frame range and convert the frame range string to a frame range object for easier handling. You can ignore the views for now. create a camera node from meta data. 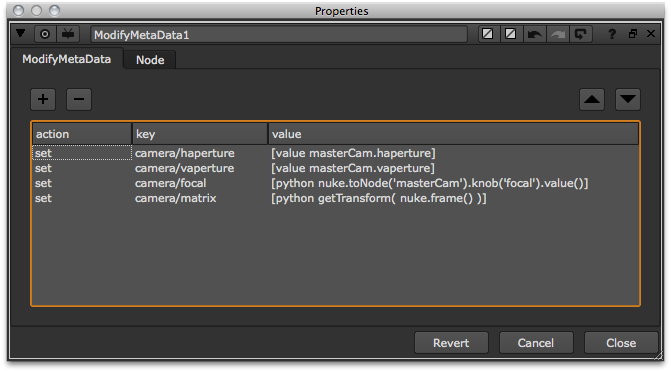 where 'matrix' carries the result of "[python nuke.toNode( 'Camera1' ).knob('world_matrix').valueAt( nuke.frame() )]"